Dr.Chyrisse Wilkins is a licensed and certified chiropractic sports physician serving Prince Georges County of Maryland. DR. Wilkins was born and raised in Northern New Jersey. It was there where she graduated from Bergen community College in 1987 and received her degree as a radiological technologist. She worked in the radiology field for a year, until she felt her calling was in non-medical approach to health care. The next year, Dr. Wilkins moved to Atlanta Georgia and attended Life University College of Chiropractic. She graduated in 1993 and decided to move to the Washington DC area to practice. Dr. Wilkins worked as associate Doctor in Mitchellville MD for a year. 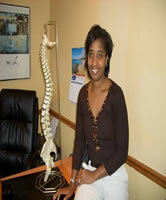 She then opened her own office in 1996, which is known as Wilkins Chiropractic center in Clinton, MD. Dr. Wilkins has taken care of thousands of patients with various injuries and aliments. As a Chiropractor with years of experience Dr. Wilkins is committed to promoting optimal health and well being of her patients. Dr. Wilkins has had the unique opportunity to be introduced to a laser allergy treatment that eliminates allergens in the body. This treatment is painless and effective and has been integrated into her practice in 2010. This is a great benefit for allergy suffers. Dr. Wilkins approach to wellness means looking for underlying causes of any disturbance or disruption and make the appropriate interventions and lifestyle adjustments that would optimize the conditions for normal function. Using this approach, Dr. Wilkins is able to help accelerate and achieve your goals to maintain good health. Dr. Wilkins enjoys playing golf, waters sports, skiing, rollerblading and riding her motorcycle.